Registered dietitian Diana Dyer describes what she changed in her diet and lifestyle to maximize chances for recovery and improve quality of life after cancer. Diana provides realistic sample menus, dining out tips and helpful nutrition information along with her story of healing and survival. 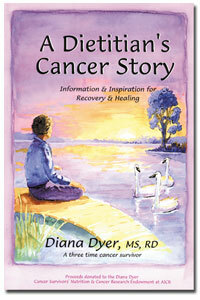 Proceeds from the sale of this book go to an AICR endowment to fund research on diet and cancer survivorship.